Spanning the Thames and connecting Tower Hamlets to Southwark, Tower Bridge has been an iconic part of London since the Victorian period (and often wrongly called London Bridge, which is a different, less beautiful bridge). Today, it sees thousands of tourists and commuters crossing over it while ships pass beneath its drawbridge. While London Bridge had served this purpose for centuries before, the increase in trade brought on by London’s expansion necessitated a new crossing point in East London. Rather than continue to rely on the barges that would ferry people from one side to another, the government determined that a new bridge should be constructed for the masses. The City of London Corporation made the decision to build the bridge and formed a special committee to solicit entries for a design. The Corporation wanted to ensure that whatever design was chosen, it would not only permit crossing over the Thames, but that it wouldn’t disrupt traffic flow on the river. Of over fifty designs submitted to the committee, the one they chose was that of Horace Jones, the City Architect. In an interesting twist, Jones was not only the City Architect, he was also ones of the judges. Despite the committee forming in 1876, it wasn’t until 1884 that Jones’ entry managed to win. John Wolfe Barry was chosen to be the engineer on the project and construction began in 1886. Jones died not too long after this in the same year and George D. Stevenson took over. Stevenson and Barry would tweak the original design with two equal bascules to permit ship passage, brick, and a more Victorian Gothic style. 432 workers were brought in from all over the UK for the construction, sinking two massive piers into the river to support the work and utilising over 11,000 tons of steel to create the framework. The bridge had five major contractors and took eight years to complete. 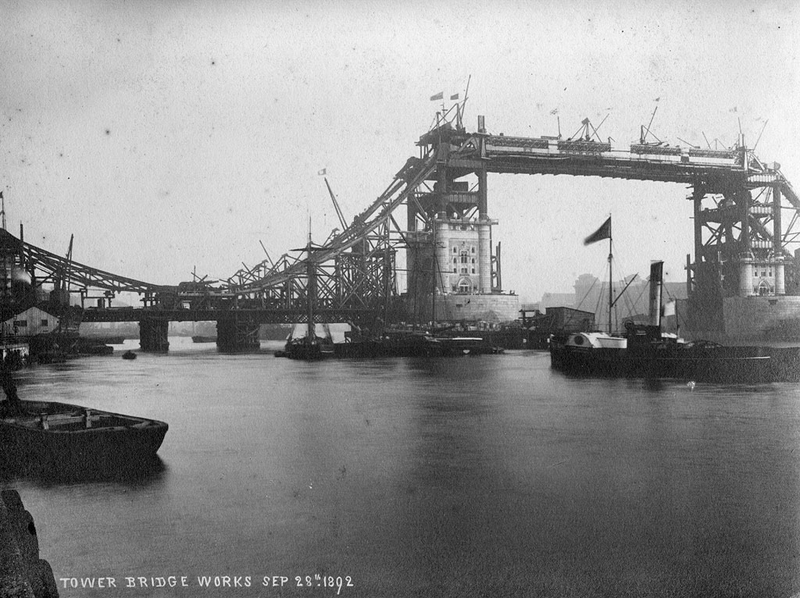 The Prince of Wales (the future King Edward VII) officially opened Tower Bridge on 30 June 1894. Of course, the bridge’s history didn’t stop here. Oddly enough, one the fastest ways to cross the Thames before the bridge was not over Tower Bridge, but underneath by using the Tower Subway, which opened in 1870. However, the subway itself didn’t last too long and it was turned into a pedestrian walkway. Some of the foot traffic changed from the tube to the walkway that went over the bridge, but unfortunately this was closed in 1910 due to disuse and a bad reputation for crime. Two years later, an emergency forced pilot Frank McClean to fly between the walkway and the bascules. Another engine to open the bascules was installed during World War II as a precaution in case Tower Bridge was hit during the Blitz. After the war, another interesting moment took place when bus driver Albert Gunter had to jump the bascules when they began raising while his No. 78 bus was still on them. Needless to say, he made it across with only a few minor injuries to his passengers. Speaking of the bascules, it may seem strange that the bridge’s raising hydraulics were powered by steam for decades until they were replaced with more modern electronics in 1976. The bascules would be further modernised in 2000 when a computer system was installed that would permit the bridge to be raised and lowered remotely. 1982 saw the reopening of the walkway above the bridge as part of the Tower Bridge Exhibition. The bridge has seen itself decorated a number of times, once in 1976 for Queen Elizabeth II’s Diamond Jubilee, and most recently for the London 2012 Summer Olympics. Tower Bridge today is as elegant as it has ever been. 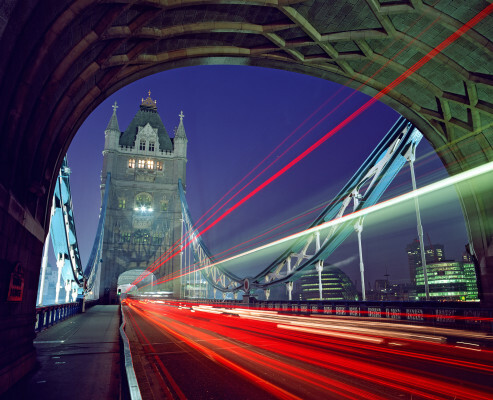 Anyone travelling to London needs to make sure that they take a tour that permits them to pass over the bridge, or maybe even walk it for themselves. The Tower Bridge Exhibition is ongoing and presents an excellent opportunity to learn more about this great London landmark. A lot of facts that I didn’t know. Thank you for this History lesson! The Queen’s Diamond Jubilee was 2012, not 1976. Her Silver Jubilee 1977 and Golden Jubilee 2002. I learn so much at your websites. Thank you!